Tamil New Year Wishes ! Very happy new year !!!!! New Year Wishes to you too !! Happy new year wished to u too.. 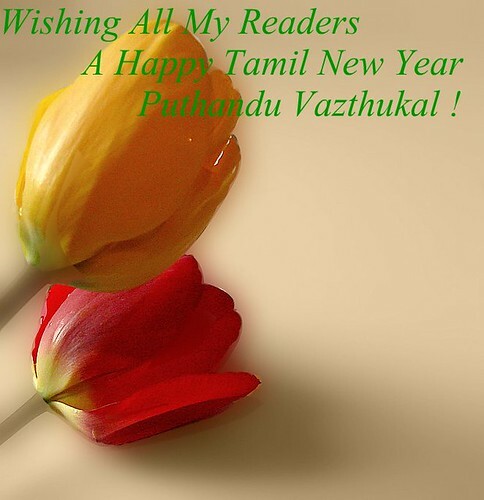 Wish u a very happy Tamil New Year. You have a lovely blog.Following u.
Tamil Puthandu nalvalthugal to u too! En Iniya Puthaandu Nal Vazhthukkal to you too. HAPPY NEW YEAR TO you and ur loved ones!! En Iniya Thamizh puthandu nalvalzhukal! Oh! Lovely picture :-) and Happy New Year to you! New year wishes to you as well! Wish you happy new year!! Thank you so much and happy New Year to you too. I really love your site.